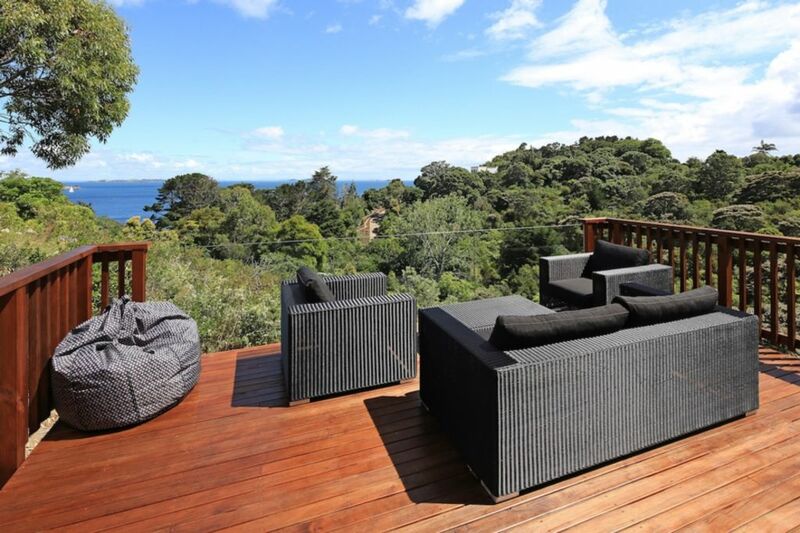 This lovely holiday property features stunning sea and rural views and a great central location to explore Waiheke Island. Perched above Sandy and Enclosure bays in Palm beach, Isola is a newly completed 3 bedroom home with easy access and all new furnishings. The main living level features a spacious open plan living, kitchen and dining area opening on to a sunny deck with BBQ and comfortable outdoor seating. One double bedroom, a full bathroom and laundry area are also on the main living level with an additional two bedrooms and 2nd bathroom located on the lower level. Isola is located a few minutes drive to Oneroa village, award winning vineyards and restaurants including Mudbrick, Kennedy Point and Cable Bay as well as the stunning white sands of Palm Beach. The supermarket, iconic Saturday farmers market, ferries, local cafes and shopping are all within a 5 to 10 minute drive. A vehicle is available with this property. Please enquire for rates and availability. Great central location perched above Sandy and Enclosure Bays. Loved the house, and the location to Enclosure and Sandy Bays was great for us. Loved the house, and the location to Enclosure and Sandy Bays was great for us. Will definitely be back next year.